It has been nearly four years since Monkey boy entered Primary school. I remember back then when he was in K2 I had to decide in July/August which school I should send him to. It was a very important decision back then as his entry to the Primary school of my choice would mean that I didn’t need to worry about Primary One admission for his siblings as it would mean a guaranteed entry for them. In 2011 I wrote about Preparing for Primary One detailing what I had done while preparing Monkey boy for Primary one. The registration processed hasn’t change that much since there. The only difference is that registration for Phase 2C can be done online and Citizens are given two ballot slips in the event of a ballot at their chosen primary school. I’m sure you know how important it is for a child to have a good and solid foundation from young in order to succeed in life. I believe in not putting my child in a pressure cooker environment or one that can stifle his growth instead of promoting it. It is with this in mind that I chose a school that wasn’t overtly focused on academic excellence and promoted holistic development of the child. The school also had to be able to cater to the different learning styles and pace of my 3 kids. I am lucky that I was able to see experience first hand the learning environment in the school that the boys are currently studying in. I had the privilege to teach at that school for two years before going on NPL when Tiger Girl was born. You can say that I am well versed with the culture of the school and know both from an educator and a parents view how the Singaporean Education system is like. I know the positive and negatives points of it and how to help my kids get the best out of it. Even though academic results do play an important part in opening doors to further education learning morals and values are what will see you through the rest of your life. An A+ report card means nothing if one is lacking the EQ and other survival skills. I wasn’t that concerned with the technicalities of admission when it was time for Doggie boy to be registered for Primary One. With his elder brother already in school he was already guaranteed a place under Phase 1. 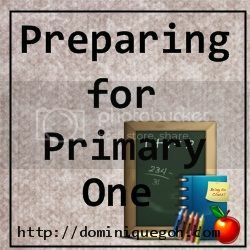 I decided to focus on the physical and mental preparations that I went through with him and wrote the series – Preparing for Primary One the 2nd time around. Now that he is in Primary Two and have gone through the first year of school without any issues it has reaffirmed that I have made the right decision back then on which school to send the kids. Are you among the group of parents registering your kids for Primary One this year? How would you be deciding on where to send your child? What is expected of your child. For the past three weeks I have been sharing with you what I have been doing to prepare Doggie boy for primary one. Today in the final installation I will be answering questions that were asked by my readers in regards to preparing their kids for primary one. Question #1 –How much pocket money is consider as enough for P1 kids? My answer: $1.50-$2 a day. The price of food has increased over the year. It costs anything between $0.70-$1.20 for a plate or bowl of food during recess. Your child would be able to save a bit if he brings his own water bottle and do not buy drinks. Question #2 – How much parental involvement is involved? Do you help with packing the schoolbags, or do you let them handle it themselves, and not bail them out if you forget something? How much homework supervision is healthy? In the initial few weeks I do check his bag after he has packed it. I let my kid do all the packing of the school bag by himself. I won’t bail them out if they forget to bring a book/item to school. He has to face up to the consequences if he doesn’t pack his bag properly or forgets to bring an item. I do check my child’s homework after he is done and do check with the teacher off an on how he is performing in school. simple descriptive sentences for composition writing (Eg, Jane is wearing a red blouse and blue jeans. Having a dialogue with the examiner based on a given scenario. Students will be graded based on clarity of delivery and content. Question #4- P1 classes are typically much larger – 30+ to 40 pax. This may intimidate a child. What can a parent do to ease the child into it? My answer: It depends on which kindergarten your child has been to. Some like PAP have bigger groups with 20 kids or more in the class so they may have already been used to big groups. As a parent you can bring your kid out to events for their age or sign them up for holiday camps with activities for groups of 30-40 people so that can get used to being around a larger group of kids. Question #5- How would you handle bullying? If your kid is bullied, how do you help the child to tell him / her that it is NOT OK and what the child needs to do? My answer: I will advice the child to approach the teacher or an adult if he feels that he is being unfairly treated. He should tell the person to stop or go away from the aggressor. It is not okay to keep his feelings to himself but approach an adult for help if cannot stop the unwanted behaviour on his own. Do you have any other questions which you want me to answer? Do put them in the comments below.